Grandview's beloved, unofficial mascot--Ebenezer the Donkey--is once again facing some challenges that his caretakers hope he can overcome with a little help from his friends. If you have missed seeing the donkey trotting around his tree-covered lot on the west side of Grandview's Main Street this summer and fall, there is a reason. "In May, Ebenezer started having issues with arthritis on the stifle joint and the howk joint," caretaker Shirley Phillips explained. To get up off the ground, the donkey had to be picked up using furniture straps over the course of several months. An injection of an amino acid has helped Ebenezer once again get up on his own. However, the donkey needs to have the shot every two weeks for the rest of his life. "We don't want to put him down because he's still really healthy besides the joints not working as well as they used to," Phillips said. Friends and fans of the donkey can help in several ways. A 2012 Ebenezer calendar is now on sale for $17 at May Milling, 606 Main Street, in downtown Grandview. The calendar features photos of the donkey showing his lively spirit, dressed in everything from his winter coat, to a variety of holiday-related hats each month. All proceeds will go toward Ebenezer's continued care. "The 12 month calendar that has been put together is by George Gross, a professional photographer that is smitten with Ebenezer just like the rest of us," explained Joe Dimino, who administers the donkey's website. "This is a must for all fans of Ebenezer." Those who wish to purchase the calendar online can do so as well. 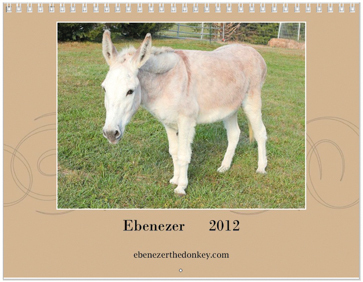 Visit www.ebenezerthedonkey.com and click on the Shutterfly link to purchase the calendar. Ebenezer's new veterinarian has also agreed to accept donations for the donkey's medical care. The Koch-Stigge Veterinary Clinic can be reached at (816) 380-1990, or by mail at 28204 Southwest Outer Road, Harrisonville, MO 64701.